Here’s an update on the sidings at Farthing, or "Old Yard" as I have now dubbed this part of the station. I have reached the point where detailing can begin. I'm going for the uncluttered look, although a few weeds etc will be added at some point. Inside the "biscuit shed" we find an old timber built buffer stop. Like the shed itself, it is a survivor from N&SJR days, before the GWR gobbled up the proud little station and turned it into a goods yard. Being a modest lot, the N&SJR built their stops from coffee stirrers. Elsewhere, standard GWR stops rule the day. 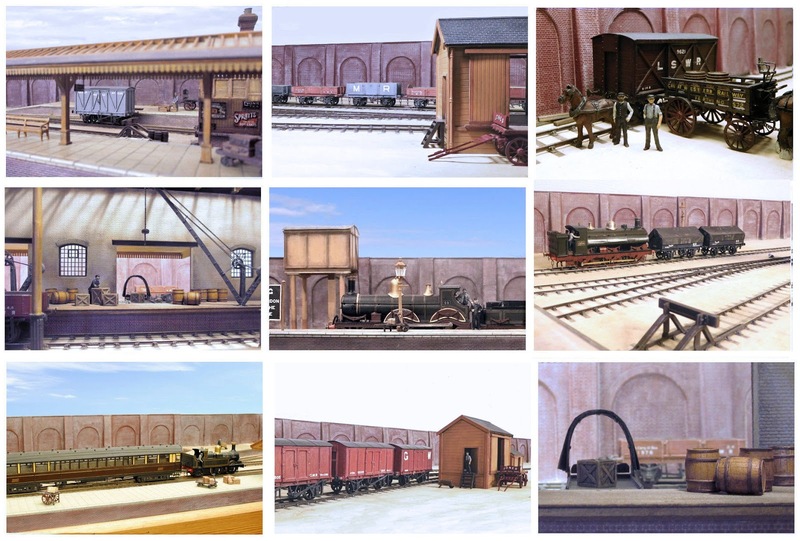 These were made from the rather nice offerings from Lanarkshire Models. I've modified the kits slightly by removing the left hand section of plain whitemetal rail, as I needed to have proper rail as far in as possible. The finished kits have a nice chunky appearance. They look like they could, er, stop a train. Close-ups can be so cruel. Someone will be having a word with the PW gang about those chairs, not least the missing one! I've also made some point levers, originally from the Southwark Models range, now available from Roxey Mouldings. They appeared around 1900 and can be seen in some sidings, yards and sheds of the period. There were two types and the kit allows for both. I chose the simplest type. I chickened out on the soldering. Gel type superglue worked fine though. The only issue I had was with the weights, which are built up from layers. They do need opening out, and the handles need slimming down to accept them properly. As you can see, I struggled a bit with this. 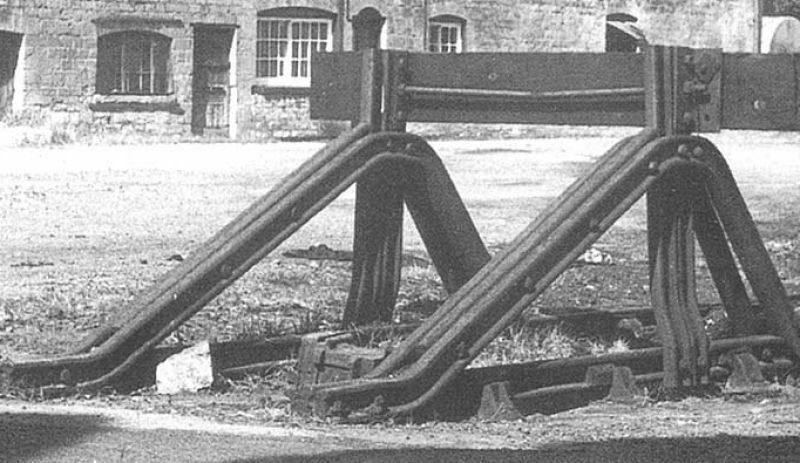 This cropped detail from a larger photo shows how the levers tended to be fitted on extended timbers, with the rodding often - but not always - boarded over. The boards were arranged in various ways, sometimes parallel to the track, sometimes perpendicular to it. I wanted to suggest something rudimentary so went for this arrangement, although these low shots suggest that I should perhaps add some boards at the side. I wonder how shunting horses navigated the levers? Another crop here, showing what seems to have been the standard painting scheme, ie weight and main lever was white, the rest was black (including the tip!). The points - so nicely built by John Jones - use a moving timber as tie bar. I laid the boards to accommodate this, so that the timber slides below the boards. I really must trim that pin! I've also added some fishplates. On my last layout I used the etched ones on the left, but felt that they were virtually unnoticeable. So I decided to experiment and use the plastic variant this time, which has more pronounced moulding. These are intended mainly for isolating gaps, so a slight modification of the rear side was needed. But alas, I hadn't thought it through. The result looks OK from a distance, but in close-up they appear quite thick. Of course it doesn't help that there is no actual rail join in this case! A loading gauge has also been made, using the Smiths kit of the simple, early variant. ...looking at photos from the period suggests light stone on this type. Above is one example cropped from a larger photo, PM me for others. Stephen Williams' Great Western Branchline Modelling is onto something similar in his livery guide (Vol 2 p71). He says dark stone for base of post and white for the rest, but adds that some may have been all over light stone. Could it be a period thing, or was there perhaps a difference between wooden and metal types? Finally, a note on the backscene. After much back and forth, I ended up with my usual solution: A simple embankment wall. Once again I used the vacuum formed product from Langley. It isn't particularly well detailed but I feel it works OK as an unobtrusive background that adds to the atmosphere but doesn't steal the show. Such heavy infrastructure may seem like overkill for a handful of sidings, but I wanted to avoid a rural look, and indicate that we are seeing the margins of a larger yard and station.